It is not news that the current administration is unfriendly to landscape scale conservation (see The Living Landscape – Observer Outsized threats to Large Landscapes) So it is no surprise that a proposed Department of Interior (DOI) rule-making has taken another step to discourage landscape conservation. This time by making it more difficult for the public to nominate historic properties and in particular cultural landscapes to the National Register of Historic Places. The reason for this proposed change in the regulations is not hard to find. Recognition of the cultural value of landscapes is seen as an impediment to the administration’s allies who have interests in resource extraction and energy development projects. 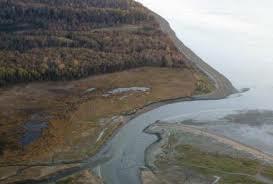 One high profile example is the potential listing of the Chu’it’nu region in Alaska, as a living traditional cultural landscape. This set off alarm bells in government and industry circles. In particular because it might stop a proposed surface coal mine touted as being among the largest open-pit coal mines in the United States. As part of the permitting for the mine, the Corp of Engineers, required a cultural resource assessment, but only for the footprint of the proposed mine. And a subsequent survey only identified archaeological sites as significant. The fact that the descendants of the people who left those sites still lived in the larger landscape was ignored. So too was the fact that they had carried on uninterruptedly from pre-contact times to the present subsistence practices centered on the keystone species of wild salmon. Also ignored was the vital social and spiritual aspects of the indigenous community based on their traditional subsistence based life way. The native community argued that the whole drainage was eligible for the NRHP as a cultural landscape. And further argued that the proposed mine would adversely affect the watershed and most critically the salmon on which their culture depended for survival. Read the determination of eligibility here. Today both the mine and the national register nomination are on hold. However, the alarm bells are still ringing. This is only one example. Many more could be cited such as the designation of Oak Flats in Arizona as a traditional cultural property. See the article Designation of mining site provokes law makers anger. lIn addition, let’s not forget the underlying rationale for reducing the size of Bears Ears National Monument and other national monuments. These cases are one reason the DOI fired back with a series of proposed changes to slow down national register nominations at a landscape scale, particularly those that include a mix of federal and other land ownership and owners of large tracts of land. The Deep Freeze– One change states that if federal property is included in a nomination proposed by a State Historic Preservation Office, the federal agency would be able to put the nomination on hold and keep it from even being considered for listing. The change is based on a wrongheaded interpretation of provisions in the Centennial Act (2016), which were supposed to provide more options for nomination not less. Under this new rule, faceless bureaucrats, or more likely their political masters, would decide what gets recognized by listing in the National Register of Historic Places – our nation’s list of what is significant for the American people. Inconvenient nominations, to quote Preservation Action, would now be sent into “regulatory purgatory” or as noted above placed in the deep freeze. Nominations supported by local governments, tribes, community groups, main street managers, or property developers could all be held hostage by this action. Remember regulations are supposed to carry out the intent of legislation enacted by Congress. The tactic of placing national register nominations in the Deep Freeze is problematic as it is based on a misinterpretation of the Centennial Act, but the Size Matters tactic is based on nothing at all! This post highlights the impact on landscape scale nominations, but the proposed rules will have cascading adverse impacts on nominations from across the country. For the full text of the rule-making and information on how to comment go to this link National Register of Historic Places. Comments are due April 30, 2019.